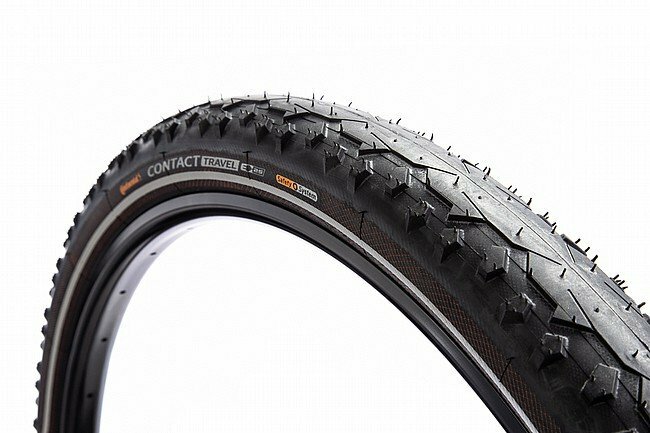 The Contact Travel Reflective 700c Tire from Continental is durable and comfortable, designed with a semi-slick tread design that's great for all-terrain endurance and touring. Two protection systems -- Safety System Breaker and Duraskin -- keep this tire inflated and rolling well beyond the lifespan of many other tires thanks to features like an aramid reinforced fabric layer under the tread and a lightweight, cut-resistant sheath. With such durable construction, the Contact Travel is e-bike compatible, too -- recommended for e-bikes of up to 25km/hr. I've been using Continental Contact Travels in size 37c (1st set) and 42c (2nd set) on my Soma Saga touring frame with canti rim brakes for nearly 9 years! Lots of broken glass, stray pieces of road cacti, goathead thorns and rugged broken roads with mixed gravel in southern Arizona, and I've never experienced a flat out on the open road! I now know why these tires have a cult-like following. Will buy more of these from BTD best prices and service!